Some good news for all of you who walk or bike on Lincoln Avenue. 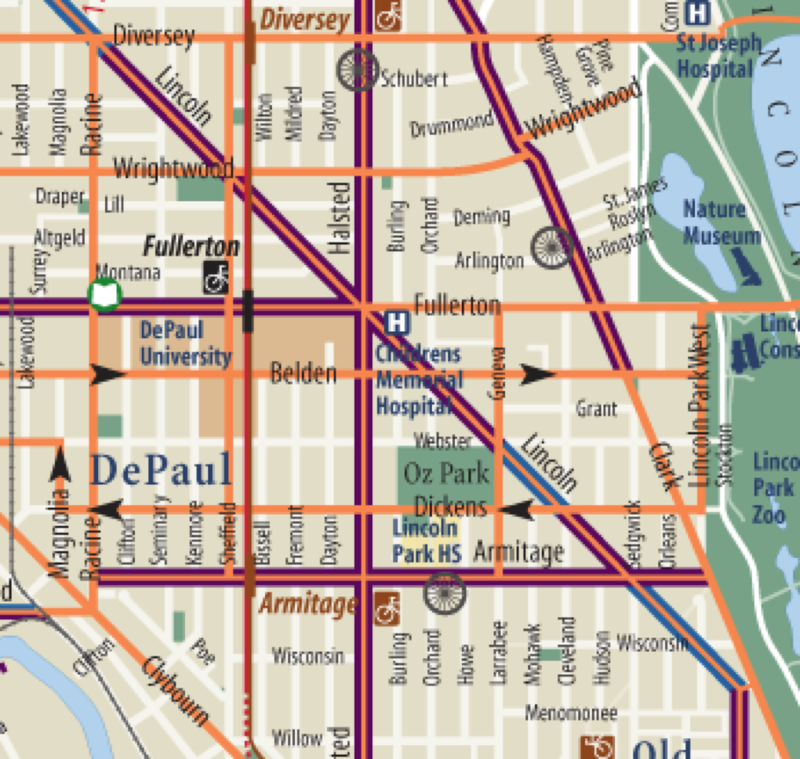 Alderman Michele Smith has advised that Lincoln, from its start at 1800/Wells Street to 2800/Diversey Avenue, will receive some much-needed attention from the Chicago Department of Transportation. CDOT workers will repaint pedestrian crosswalks as well as re-mark the bike lanes on that two-mile stretch. Just in case you don't think this area needs work, take a look at these "before" photos. The crosswalk at Lincoln and Webster is barely visible even in bright sunlight. How about the bike lanes? They're in just as bad shape. 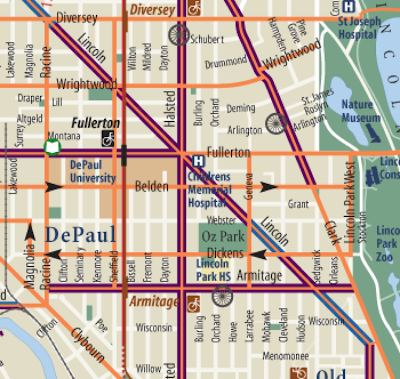 Here's the city's official bike map, showing most of Lincoln Park. Notice how Lincoln Avenue is either a blue line, indicating a shared lane (with a bike symbols and special arrows called "sharrows"), or a red line, indicating a full bike lane (with two stripes on either side, plus the bike symbols). Looks great on the map, doesn't it? Here's the reality as it looks today. The stripes on either side of the Lincoln Avenue bike lane north of Wrightwood are barely visible. Lincoln Avenue's bike lane just south of Diversey looks like a Rorschach inkblot. What do you see in it? We hope that many or most of these problems will be addressed. We have also asked that bike lane striping be extended through intersections whenever possible, as we have seen happening in River North at Wells and Chicago. We'll post the "after" pics in another week or two. Stay tuned! They did much of this yesterday. The new lines look nice, but they didn't put any dashed lines through the intersection (which would have been great). Did Michelle Smith pay for this with her menu funds?